Dr. H. D. Roberts, our popular vetinary [sic] surgeon, is riding day and night on account of so much diseases among the cattle. 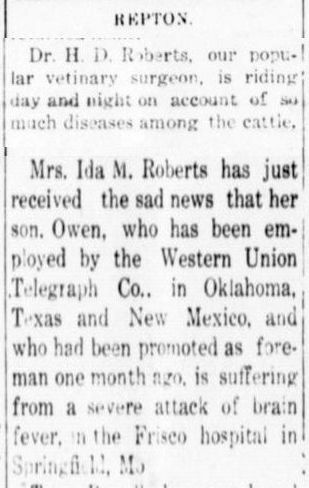 Mrs. Ida M. Roberts has just received the sad news that her son, Owen, who has been employed by the Western Union Telegraph co., in Oklahoma, Texas and New Mexico, and who had been promoted as foreman one month ago, is suffering from a severe attack of brain fever, in the Frisco hospital in Springfield, Mo. Source: Crittenden Record-Press. (Marion, Ky.) 1909-1918, March 14, 1912, Image 7 - Chronicling America - The Library of Congress. 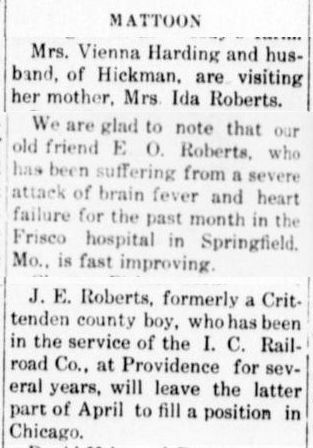 Mrs. Vienna Harding and husband, of Hickman, are visiting her mother, Mrs. Ida Roberts. We are glad to note that our old friend E. O. Roberts, who has been suffering from a severe attack of brain fever and heart failure for the past month in the Frisco hospital in Springfield, Mo., is fast improving. J. E. Roberts, formerly a Crittenden county, boy, who has been in the service of the I. C. Railroad Co., at Providence for several years, will leave the latter part of April to fill a position in Chicago. Source: Crittenden Record-Press. (Marion, Ky.) 1909-1918, March 28, 1912, Image 4 - Chronicling America - The Library of Congress. A revival meeting is being conducted at Seminary school house by Rev. Harding and wife. Mrs. Harding was formerly Miss Vienna Roberts, and was well known around here. Source: Crittenden Record-Press. (Marion, Ky.) 1909-1918, March 28, 1912, Image 8 - Chronicling America - The Library of Congress. 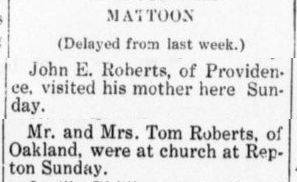 Mrs. Ida M. Roberts has returned from a visit to her son, John E. Roberts, of Providence. Source: Crittenden Record-Press. (Marion, Ky.) 1909-1918, May 9, 1912, Image 7 - Chronicling America - The Library of Congress. 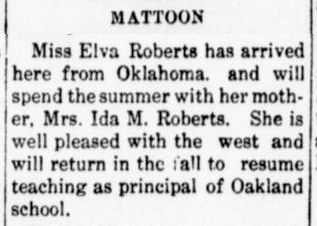 Miss Elva Roberts has arrived here from Oklahoma and will spend the summer with her mother, Mrs. Ida M. Roberts. She is well pleased with the west and will return in the fall to resume teaching as principal of Oakland school. Source: Crittenden Record-Press. (Marion, Ky.) 1909-1918, July 4, 1912, Image 8 - Chronicling America - The Library of Congress. 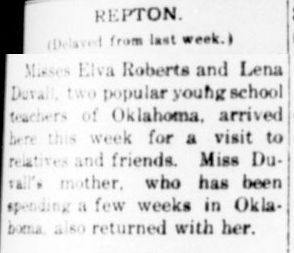 Misses Elva Roberts and Lena Duvall, two popular young school teachers of Oklahoma, arrived here this week for a visit to relatives and friends. Miss Duvall's mother, who has been spending a few weeks in Oklahoma, also returned with her. Source: Crittenden Record-Press. (Marion, Ky.) 1909-1918, July 11, 1912, Image 7 - Chronicling America - The Library of Congress. People We Know at Providence. 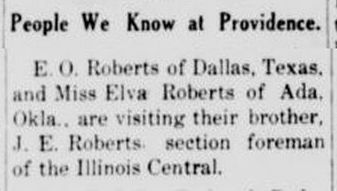 E. O. Roberts of Dallas, Texas, and Miss Elva Roberts of Ada, Okla., are visiting their brother, J. E. Roberts, section foreman of the Illinois Central. Source: Crittenden Record-Press. (Marion, Ky.) 1909-1918, August 1, 1912, Edition 2, Image 1 - Chronicling America - The Library of Congress. 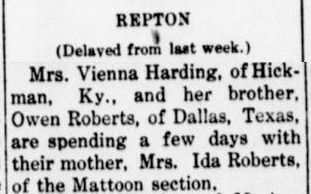 Mrs. Vienna Harding, of Hickman, Ky., and her brother, Owen Roberts, of Dallas, Texas, are spending a few days with their mother, Mrs. Ida Roberts, of the Mattoon section. Source: Crittenden Record-Press. (Marion, Ky.) 1909-1918, August 1, 1912, Image 3 - Chronicling America - The Library of Congress. Miss Elva Roberts was in Marion Monday. Source: Crittenden Record-Press. (Marion, Ky.) 1909-1918, August 15, 1912, Image 7 - Chronicling America - The Library of Congress. Miss Elvah [Elva] Roberts is visiting relatives in Providence. Source: Crittenden Record-Press. (Marion, Ky.) 1909-1918, September 26, 1912, Image 8 - Chronicling America - The Library of Congress. 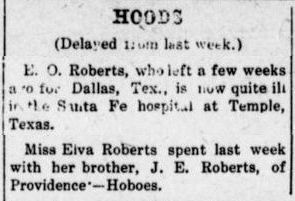 Miss Elva Roberts, of Ada, Okla., is the guest of her brother J. E. Roberts. Miss Roberts is a teacher in the Ada high school. Source: Crittenden Record-Press. (Marion, Ky.) 1909-1918, October 3, 1912, Image 4 - Chronicling America - The Library of Congress. Miss Elva Roberts is visiting the family of Mack Brantly. Miss Elva Roberts who has spent the summer here with her mother will leave for Oklahoma soon, where she will again teach school the remainder of the year and next year until May. Miss Roberts likes Oklahoma and considers it a fine field for the school teacher as well as for other professions. Omen [Owen] Roberts spent last week at Providence the guest of his brother John E. Roberts of that place. Edgar Kemp is visiting his sister here. Mr. Kemp has spent several years in the "sunny south" and talks of returning to Florida. Bro. Harding and wife are holding a series of meetings at Applegate school house. They are assisted by brother Helden of Illinois. Source: Crittenden Record-Press. (Marion, Ky.) 1909-1918, October 17, 1912, Image 5 - Chronicling America - The Library of Congress. Miss Elva Roberts, formerly of this county but now of Ada, Oklahoma, just left our vicinity after a week's visit with friends. She goes from here to Mattoon to be with her mother a few days, then on to take charge of her school work in the West. Miss Roberts was in our midst as a teacher, two terms and everybody here loves her for the splendid work she did here. The best wishes of a host of friends follow her into the field she has chosen. Brother Edward Harding and wife who have been conducting a meeting at this place have gone to the sunny south to engage in gospel work through the next few weeks, then they will go to New Mexico to take charge of Misson [sic] work. Sister Harding was Miss Vienna Roberts, before her marriage, and has many friends in this county. Source: Crittenden Record-Press. (Marion, Ky.) 1909-1918, October 31, 1912, Image 6 - Chronicling America - The Library of Congress. Mrs. Ida M. Roberts was in Blackford Saturday. Owen Roberts, who has been visiting friends and relatives here for several months, has returned to his work at Dallas, Texas. Source: Crittenden Record-Press. (Marion, Ky.) 1909-1918, November 21, 1912, Image 8 - Chronicling America - The Library of Congress. At this season of the year, when the leaves are falling in showers it should remind us of the time when our lives will be over, here; when we will have to turn every thing loose and descend into the grave, giving place to others. 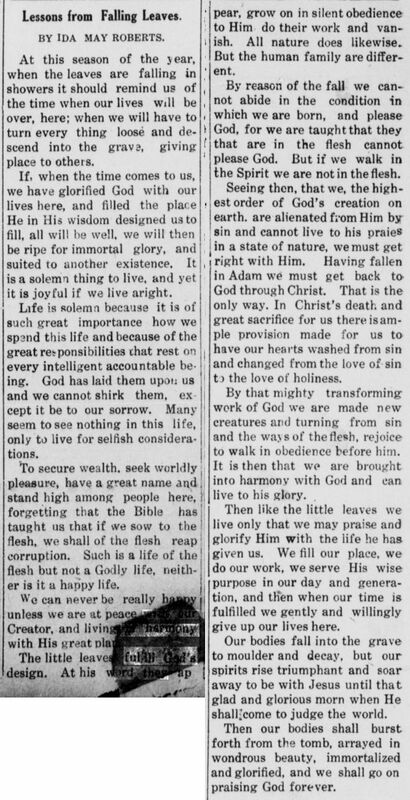 If, when the time comes to us, we have glorified God with our lives here, and filled the place He in His wisdom designed us to fill, all will be well, we will then be ripe for immortal glory, and suited to another existence. It is a solemn thing to live, and yet it is joyful if we live aright. Life is solemn because it is of such great importance how we spend this life and because of the great responsibilities that rest on every intelligent accountable being. God has laid them upon us and we cannot shirk them, except it be to our sorrow. Many seem to see nothing in this life, only to live for selfish considerations. To secure wealth, seek worldly pleasure, have a great name and stand high among people here, forgetting that the Bible has taught us that if we sow to the flesh, we shall of the flesh reap corruption. Such is a life of the flesh but not a Godly life, neither is it a happy life. We can never be really happy unless we are at peace with our Creator, and living in harmony with His great plan. The little leaves fulfill God's design. At his word they appear, grow on in silent obedience to Him, do their work and vanish. All nature does likewise. But the human family are different. By reason of the fall we cannot abide in the condition in which we are born, and please God, for we are taught that they that are in the flesh cannot please God. But if we walk in the Spirit we are not in the flesh. Seeing then, that we, the highest order of God's creation on earth, are alienated from Him by sin and cannot live to his praise in a state of nature, we must get right with Him. Having fallen in Adam we must get back to God through Christ. That is the only way. In Christ's death and great sacrifice for us there is ample provision made for us to have our hearts washed from sin and changed from the love of sin to the love of holiness. By that mighty transforming work of God we are made new creatures and turning from sin and the ways of the flesh, rejoice to walk in obedience before him. It is then that we are brought into harmony with God and can live to his glory. Then like the little leaves we live only that we may praise and glorify Him with the life he has given us. We fill our place, we do our work, we served His wise purpose in our day and generation, and then when our time is fulfilled we gently and willingly give up our lives here. Our bodies fall in to the grave to moulder and decay, but our spirits rise triumphant and soar away to be with Jesus until that glad and glorious morn when He shall come to judge the world. Then our bodies shall burst forth from the tomb, arrayed in wondrous beauty, immortalized and glorified, and we shall go on praising God forever. Source: Crittenden Record-Press. (Marion, Ky.) 1909-1918, December 5, 1912, Image 2 - Chronicling America - The Library of Congress. Another New Year! How fast the years go speeding by! Soon they will all have been lived out and we all will be in eternity. What a solemn thought and yet how true. The question arises in my mind, who, oh, who of us will have to answer to the death call in 1913? Looking back over the year we recall many we knew who passed away with 1912. The solemn summons came to them, and ready or not ready, willing or not willing they had to go. Their race is run their destinies forever sealed whether for weal or woe. They had their day of grace, their state of probation here and if they frittered away their time, wasted their lives and died in sin they are lost just as certain as the Bible is true. They may have had a grand funeral, some minister may have spoken sweet words of consolation on that occasion, but the stern fact remains that if not saved from sin here, they can never see God in peace. Another thought about the year just closed. It is forever gone. We can never call it back to improve its slighted opportunities. If well spent, it will be a source of pleasure to us as long as eternity lasts, if misspent we are guilty before God of squandering the precious moments He gives us in which to get right with him, and live to his glory for our lives are not our own. Our stay here is not that we may lay up treasures on earth, seek selfish ease, and carnal pleasure but that we may get ready for eternity, and help others to get ready. Well I am glad that whatever may have been our mistakes in the past, those of us who are living have the privilege of seeing another year that we may make use of the opportunities it presents. How thankful ought we to be for this New Year! How unspeakably precious this life is, for in it we fix our destinies for eternity. Oh there is so much to live for if we are truly awake to what life really means. The trouble is the people are so blinded and so fast asleep in sins that they fail to recognize what they are here for. May God wake us up and let us see things as they really are. I will tell you when we get fully awakened by the power of God's spirit, we see there is no time to waste. Death, judgement, and eternity are before us and we are bound to meet them. That thought is enough to solemnize every thinking soul and bring to view what this life means. Christians, let us be fully awake and take advantage of every opportunity to work and witness for God during this year. Oh, may God send power upon his true ones, that they may go forth to battle against the awful powers of wickedness. Surely if we are of God we hate sin in its every form, then let us wage war against it. Source: Crittenden Record-Press. (Marion, Ky.) 1909-1918, January 16, 1913, Image 8 - Chronicling America - The Library of Congress. Herman Clift of Fords Ferry was the guest of Lewin Roberts, Saturday night and Sunday. Source: Crittenden Record-Press. (Marion, Ky.) 1909-1918, January 30, 1913, Image 8 - Chronicling America - The Library of Congress. Lewin Robertc [Roberts], who is at work at Providence spent Saturday, and Sunday here with his mother. Source: Crittenden Record-Press. (Marion, Ky.) 1909-1918, March 13, 1913, Image 8 - Chronicling America - The Library of Congress. BY MRS. IDA M. ROBERTS. Source: Crittenden Record-Press. (Marion, Ky.) 1909-1918, March 20, 1913, Image 3 - Chronicling America - The Library of Congress. John E. Roberts, of Providence, visited his mother here Sunday. 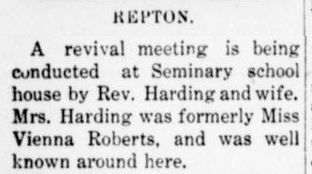 Mr. and Mrs. Tom Roberts, of Oakland, were at church at Repton Sunday. Source: Crittenden Record-Press. (Marion, Ky.) 1909-1918, May 15, 1913, Image 2 - Chronicling America - The Library of Congress. 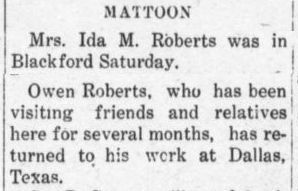 Owen Roberts, of Dallas, Tex., is visiting his mother near Mattoon. Source: Crittenden Record-Press. (Marion, Ky.) 1909-1918, June 19, 1913, Image 2 - Chronicling America - The Library of Congress. Owen Roberts was in Blackford Thursday. Source: Crittenden Record-Press. (Marion, Ky.) 1909-1918, July 3, 1913, Image 3 - Chronicling America - The Library of Congress. A courtship of 9 years standing, touched with a deal of romance, culminated last Thursday evening with the marriage of Miss Elsie Crider to E. Owen Roberts. The wedding took place at the home of the bride's father S. F. Crider, near Repton. A host of friends assembled to witness the ceremony which was beautifully pronounced by Rev. King of Webster county. The bride is beautiful and accomplished, has grown to womanhood in this vicinity and numbers her friends by the score. The groom is a Crittenden county boy who went west three years ago as an employee of the W. U. Tel. Co. His efficient service has won for him much favor with the company, he has been promoted to an enviable position which he will take care of in a short time. The happy pair will leave here in a few days for Dallas, Texas and other points west. Source: Crittenden Record-Press. (Marion, Ky.) 1909-1918, July 17, 1913, Image 4 - Chronicling America - The Library of Congress. 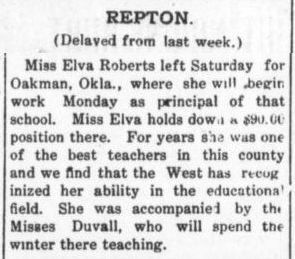 Miss Elva Roberts, who has been teaching school in Oklahoma for several years, is now at home to spend the summer with her mother. She will go back west in the fall to resume her work in the same school. Source: Crittenden Record-Press. (Marion, Ky.) 1909-1918, July 24, 1913, Image 8 - Chronicling America - The Library of Congress. 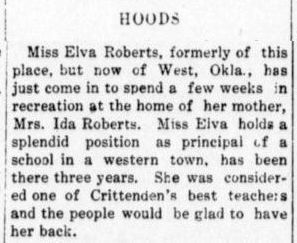 Miss Elva Roberts, formerly of this place, but now of West, Okla., has just come in to spend a few weeks in recreation at the home of her mother, Mrs. Ida Roberts. Miss Elva holds a splendid position as principal of a school in a western town, has been there three years. She was considered one of Crittenden's best teachers and the people would be glad to have her back. Miss Elva Roberts is visiting in Providence this week. Source: Crittenden Record-Press. (Marion, Ky.) 1909-1918, September 11, 1913, Image 8 - Chronicling America - The Library of Congress. E. O. Roberts, who left a few weeks ago for Dallas, Tex., is now quite ill in the Santa Fe hospital at Temple, Texas. Miss Elva Roberts spent last week with her brother, J. E. Roberts, of Providence. Source: Crittenden Record-Press. (Marion, Ky.) 1909-1918, September 18, 1913, Image 2 - Chronicling America - The Library of Congress. Miss Elva Roberts has had a musical instrument installed in her home and while spending her vacation is studying music. Source: Crittenden Record-Press. (Marion, Ky.) 1909-1918, October 2, 1913, Image 8 - Chronicling America - The Library of Congress. 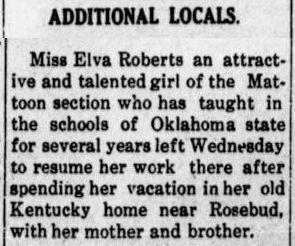 Miss Elva Roberts an attractive and talented girl of Mattoon section who has taught in the schools of Oklahoma state for several years left Wednesday to resume her work there after spending her vacation in her old Kentucky home near Rosebud, with her mother and brother. Source: Crittenden Record-Press. (Marion, Ky.) 1909-1918, October 9, 1913, Image 4 - Chronicling America - The Library of Congress. Couple Meet In The West. Miss Elva Roberts and Jesse Duvall were married at Holdenville, Oklahoma, Oct. 27th by the Rev. Campbell, Methodist minister of that place. Miss Roberts left home Oct. 25th, for Holdenville, Mr. Duvall being already in the west, met her there where plans for the wedding were completed. Both parties were born and raised in Crittenden County, near Mattoon, and have been sweethearts since childhood. She is the daughter of the late J. N. Roberts and has been teaching in Oklahoma for 3 years. The groom is the son of W. S. Duvall of Mattoon section. They will reside at Oakman, Okla. The groom has had employment there for two years and the bride will continue as principal at that place. The groom is a young man of good character and lives an upright life and is certainly to be congratulated on winning the heart and hand of one so fair and talented. Mrs. Duvall has taught 5 schools in this county and three in Oklahoma and is a noble christian girl, who has always been highly esteemed. Their "home paper," extends warmest congratulations. Source: Crittenden Record-Press. (Marion, Ky.) 1909-1918, November 6, 1913, Image 4 - Chronicling America - The Library of Congress. Miss Elva Roberts left Saturday for Oakman, Okla., where she will begin work Monday as principal of that school. Miss Elva holds down a $90.00 position there. For years she was one of the best teachers in this county and we find that the West has recognized her ability in the educational field. She was accompanied by the Misses Duvall, who will spend the winter there teaching. Source: Crittenden Record-Press. (Marion, Ky.) 1909-1918, November 6, 1913, Image 6 - Chronicling America - The Library of Congress.